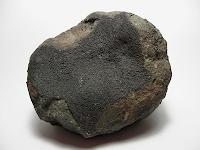 The Allende meteorite is the largest carbonaceous chondrite ever found on Earth. It fell on February 8, 1969, near the village of Pueblito de Allende in the state of Chihuahua Mexico. The original stone is believed to have been approximately the size of an automobile traveling towards the Earth at more than 10 miles per second. After breaking up in the atmosphere, it produced thousands of fusion crusted individuals and an extensive search for pieces was conducted which led into what is often described as "the best-studied meteorite in history". The Allende meteorite contains about 4% carbonaceous chondrites. The subject or organic compounds in meteorites was investigated by several authors [1-3] and for example the organic compounds of the Allende meteorite were analyzed by photoionization combined with TOF-MS and some PAHs compounds such as phenanthrene and pyrene were found . Allende Meteorite sample was provided to Prof. Aviv Amirav by Prof. Richard Zare from Stanford University during the Isranalytica 2010 meeting in Tel Aviv in January 2010. 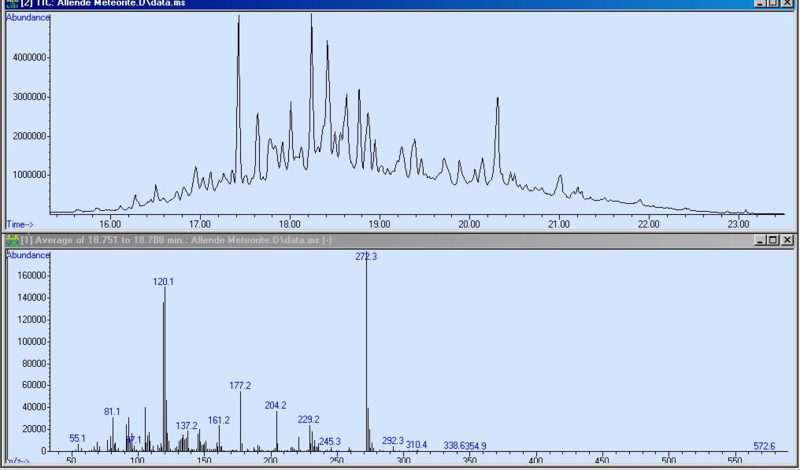 The meteorite small stone was broken with a clean tweezers into small (about 1 mm diameter) stones and it was analyzed via the use of ChromatoProbe sample introduction device for intra injector thermal extraction followed by 5975-SMB GC-MS with Cold EI analysis. 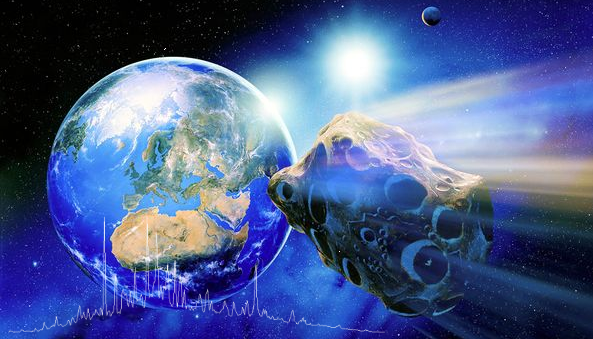 Keep reading how the Aviv Analytical 5975-SMB GC-MS with Cold EI helps in extraterrestrial matter analysis and provides new data and unique insight into the extraterrestrial matter composition and possible origin. System: Aviv Analytical 5975-SMB GC-MS with Cold EI system that is based on the combination of an Agilent 5975 MSD with the Aviv Analytical supersonic molecular beam interface and its unique fly-through ion source (GC-MS with Cold EI). The technology of GC-MS with Cold EI is reviewed in reference 4. Sampling: Aviv Analytical CPAV7890 ChromatoProbe sample introduction device at 250ºC injector temperature. Sample: Allende Meteorite as given (handed) by Prof. R.N. Zare. He column flow rate: 5 ml/min during injection with flow programming down to 1 ml/min and after 20 min up to 5 ml/min above 250C GC column oven temperature. On column amount: Estimates as ~5-10 µg of thermally extracted sample. GC Oven: 50ºC for one minute followed by 10ºC/min to 320 and wait 4 min for total time of 32 min. Flow program: was used from 5 ml/min for 1 min to 1 ml/min and 1 ml/min.min flow program above 20 min to 5 ml/min. The flow rate has no effect on tune or sensitivity thus flow programming can be uniquely used. SMB source: 4mA emission, 90 ml/min He makeup flow. SMB transferline temperature: 250ºC and temperature programmed at 10ºC/min to 300ºC after 20 min. Rich organic matter was found and analyzed. 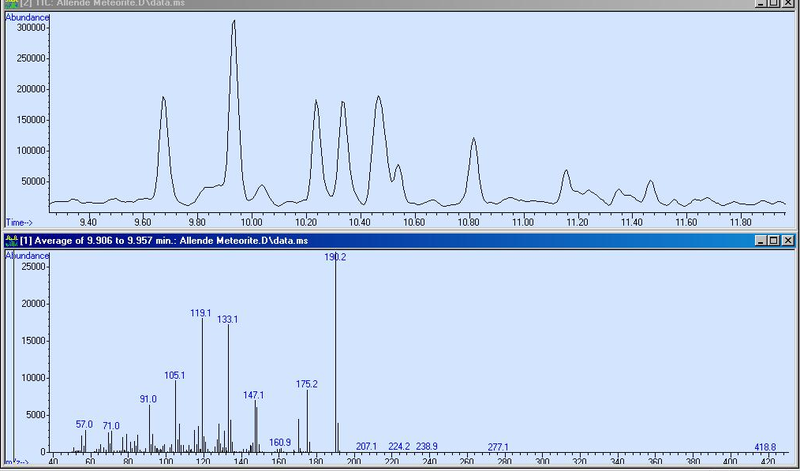 Thus, the goal of analyzing the Allende meteorite by ChromatoProbe and 5975-SMB GC-MS with Cold EI was well achieved. We took care to ensure clean ChromatoProbe and its vial but the meteorite is old and we could not ensure lack of previous earth contamination. A second analysis of the same sample revealed that it was almost fully depleted from organic matter thus the thermal desorption stage was effective. Good sensitivity was achieved as demonstrated in the figures below. Most of the organic matter in the meteorite is uniquely grouped in the 260-300 amu mass spectral range. Over 100 GC peaks were measured. Very few PAHs were found and no major PAH was identified. 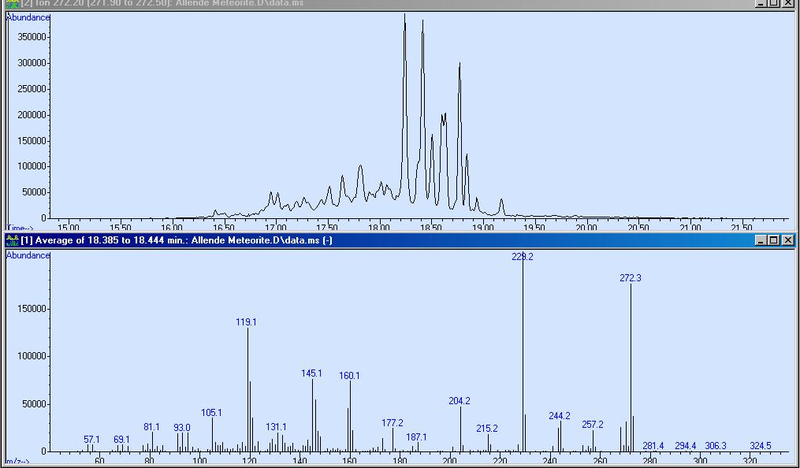 However, some of the peaks had the m/z=231 fragment peak which is a known biomarker peak of aromatic stearanes in geochemical samples. Most compounds were with about 4-5 number of unsaturated double bonds or rings meaning CnH2n-8. This could well represent also multicyclic compounds like from the steroid family or hopanes etc. The data could also be suited to a steroid like structure with four rings and an oxygen atom. A few compounds were identified by the NIST library while most could not be identified by the library. The Tal Aviv Molecule Identified software based on isotope abundance analysis was used and with it we could say that most compounds are probably hydrocarbons but the presence of oxygen is likely in a few minor compounds and cannot be ruled out. The main compound family found is with m/z=272.3 and it had many isomers. 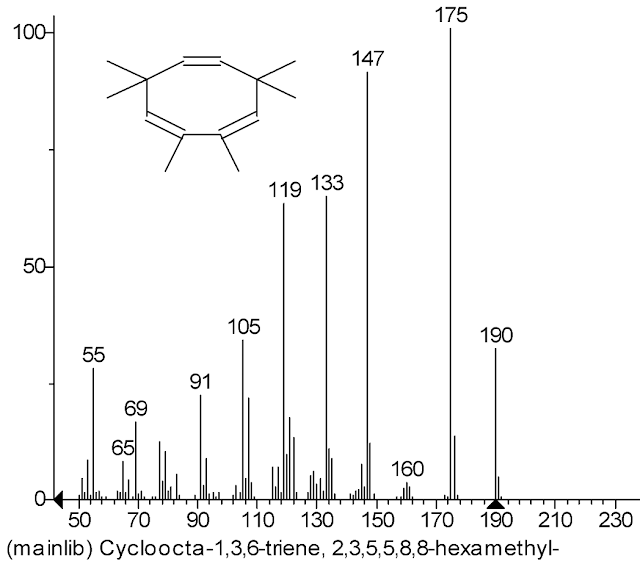 This family was identified as C20H32 family of isomers. C21H20 aromatic compounds with the same nominal mass were ruled-out for four reasons: A) We did not find doubly charged ions that are typical for PAHs in EI; B) Isotope abundance analysis of the ion ratio of M+1/M fitted much better the C20H32 elemental formula; C) The decimal point of the mass was 272.3 which is as expected for C20H32 while the exact mass of C21H20 is 272.15; D) The NIST library results based on the EI fragments ruled out the C21H20 aromatic structure. On the other hand, steroid based structure such as C19H28O which could be Androst-5-en-17-one could not be ruled out. The most striking observation is that most compounds are in a narrow mass range of 268-274 amu mass range and each with many isomers. This finding must be considered in any attempted explanation for the origin of this organic matter. 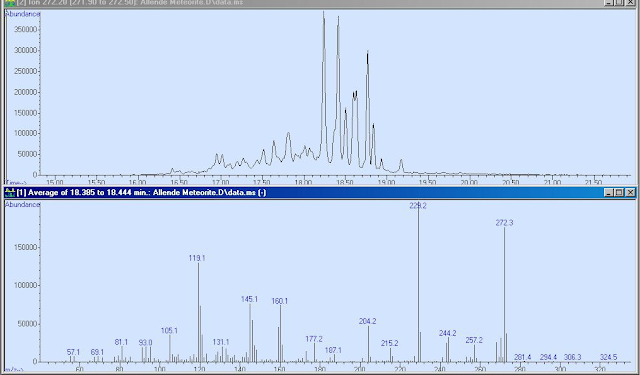 The sample chromatogram looks too odd and unique to be from an earth impurity and currently it is difficult to speculate on the importance of our findings. We tested two samples and each gave the same range of compounds but with different peak ratios thus the organic matter is not uniformly distributed in the meteorite rock. We found several saturated hydrocarbons in the range of C13H28- C18H38. Each of these hydrocarbons was mostly in the form of the linear chain hydrocarbon but they were also in the form of few branched isomers, particularly the C18H38. The C13/C12 ratio is within the 1.00-1.15% earth range. The isotope abundance analysis of hexadecane n-C16H34 shows C13/C12 at 1.12% which is 50 permill higher than on earth average but still within the terrestrial range. The peak at 10.47 min was clearly identified as benzothiazol (135 amu) by both library and isotope abundance analysis (IAA). Thus, we have a clear evidence for having a nitrogen and sulfur atoms among the sample compounds. The peak at 6.65 min is of methylstyrene (single ring aromatic). The peak at 13.55 min was identified as of 2,5-Cyclohexadiene-1,4-dione, 2,6-bis(1,1-dimethylethyl). This oxygen containing compound could be from the meteorite or it emerged from its hot encounter with the atmosphere during landing. Figure 1. 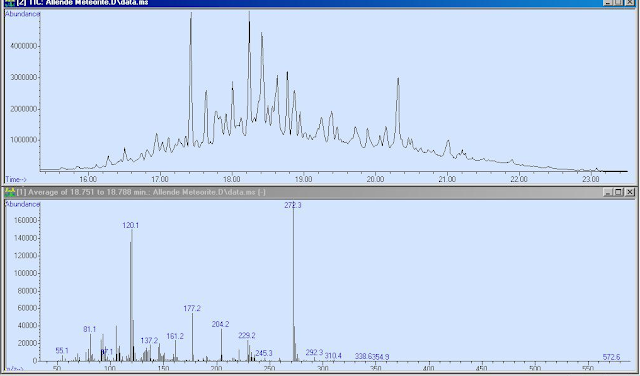 Mass chromatogram (upper trace) of a particle from the Allende Meteorite which was thermally extracted with the ChromatoProbe at 250ºC injector temperature. The chromatogram is peaked in a relatively narrow elution time range. 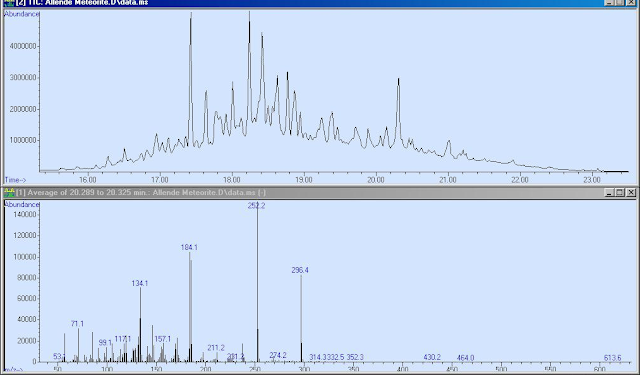 The mass spectrum (bottom trace) is an average of the full chromatogram and should be compared with laser desorbed laser ionized mass spectra without separation. Note that there are very few compounds above m/z=320. Figure 2. 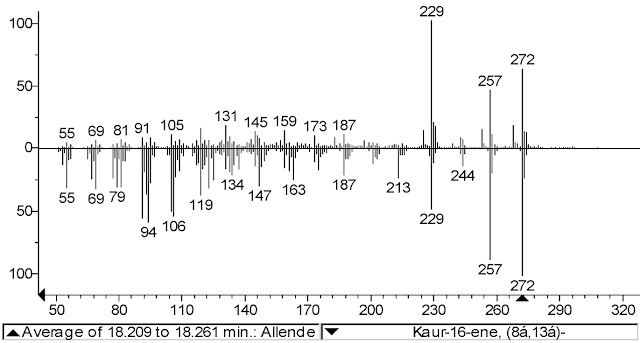 Mass chromatogram (upper trace) of a particle from the Allende Meteorite which was thermally extracted with the ChromatoProbe at 25º0C injector temperature around the first medium intensity group to elute. The Cold EI mass spectrum is of one of the 5 isomers of m/z=190 compounds. According to NIST library search and isotope abundance analysis this group could be an isomer of the compound in Figure 3. Figure 3. 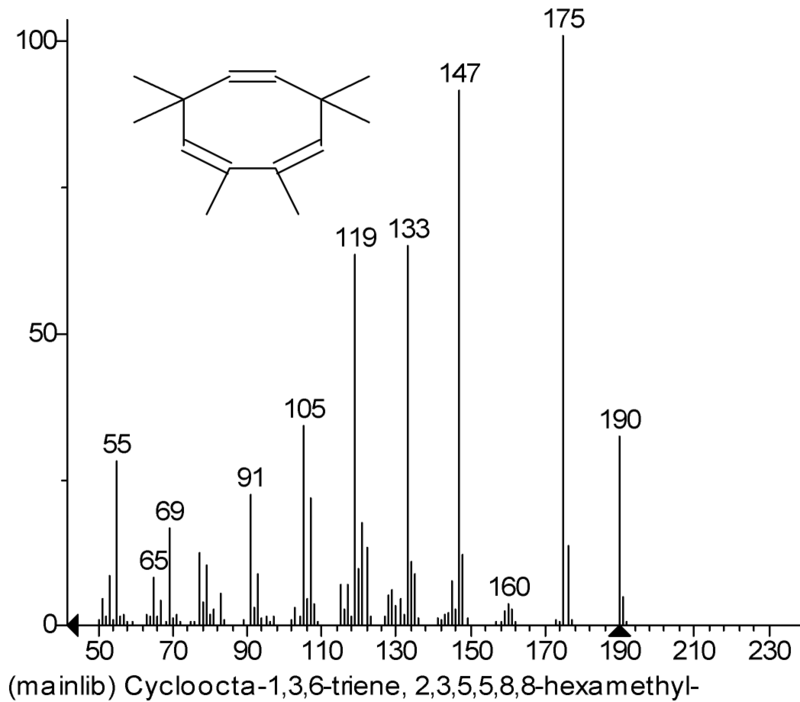 NIST library search and identification suggestion for the group of five C14H22 isomers shown in Figure 2. Note that this compound has the equivalent of four degrees of unsaturation. Figure 4. 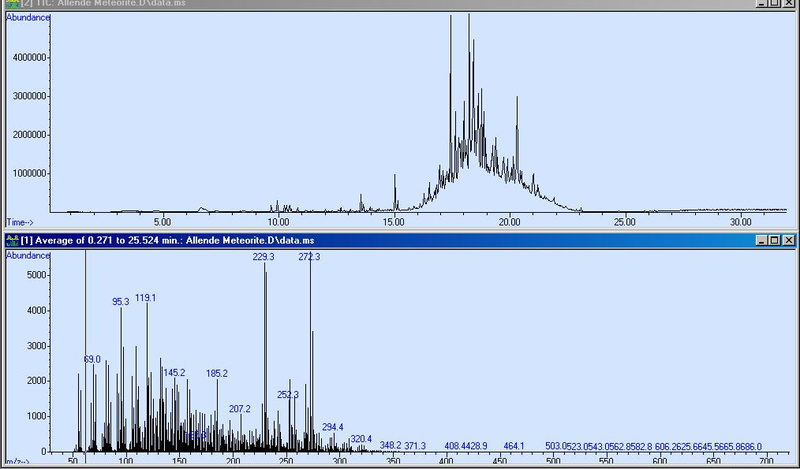 RSIM at m/z=190.2 mass chromatogram of a particle from the Allende Meteorite which was thermally extracted with the ChromatoProbe at 250ºC injector temperature around the first medium intensity group of compounds that eluted. Note the availability of 5 isomers and the good signal to noise ratio with zero noise. A suggested structure of these five isomers is given in Figure 3. Figure 5. 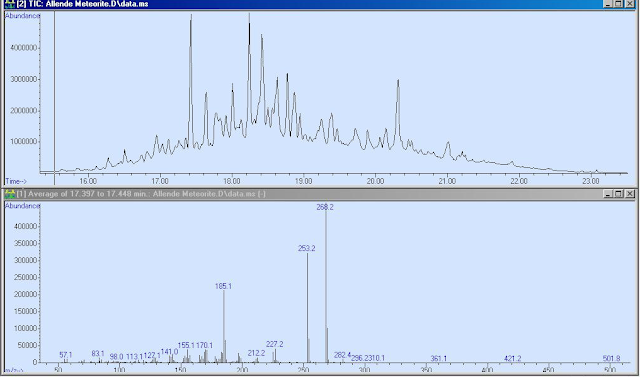 Mass chromatogram (upper trace) of a particle from the Allende Meteorite which was thermally extracted with the ChromatoProbe at 250ºC injector temperature around the hump of main group of eluted compounds. The Cold EI mass spectrum (bottom trace) is of the first major peak that eluted at 17.42 min. This compound was not identified but if it is a hydrocarbon it has several degrees of unsaturation. It is unlikely a PAH since its MS has no significant doubly charged ion at m/z=134, and its M+1/M ratio was fitted best to C20H28 by the Tal-Aviv molecule identifier software based on isotope abundance analysis. Figure 6. 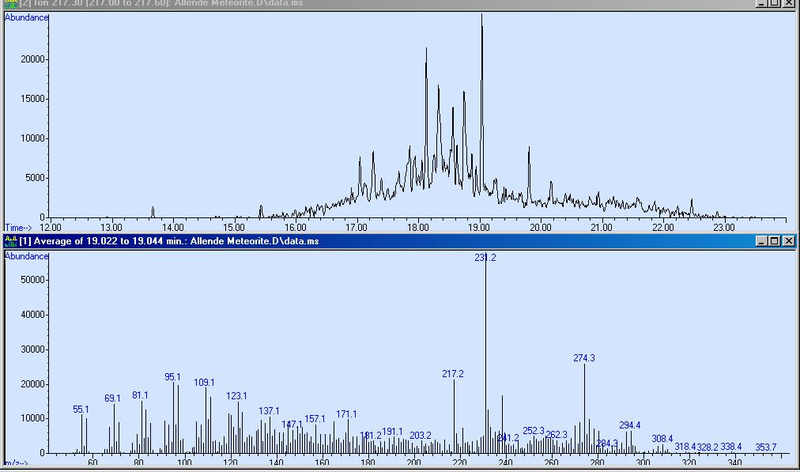 Mass chromatogram (upper trace) of a particle from the Allende Meteorite which was thermally extracted with the ChromatoProbe at 250ºC injector temperature around the hump of main group of eluted compounds. The Cold EI mass spectrum (bottom trace) is of the last major peak and no good estimate of its identification according to NIST was established. Figure 7. Mass chromatogram (upper trace) of a particle from the Allende Meteorite which was thermally extracted with the ChromatoProbe at 250ºC injector temperature around the hump of main group of eluted compounds. The Cold EI mass spectrum (bottom trace) is of one of the main peaks at the center of the hump. We are not sure about its identification but if as we believe it is a hydrocarbon is has 5 degrees of unsaturation as discussed at the conclusions. Figure 8. 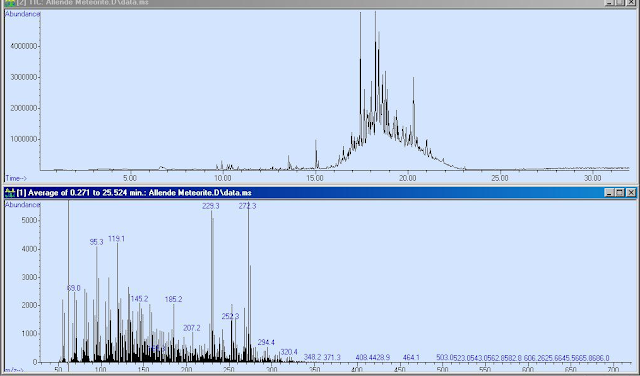 RSIM at m/z=272.3 mass chromatogram (upper trace) of a particle from the Allende Meteorite which was thermally extracted with the ChromatoProbe at 250ºC injector temperature around the hump of main group of eluted compounds. 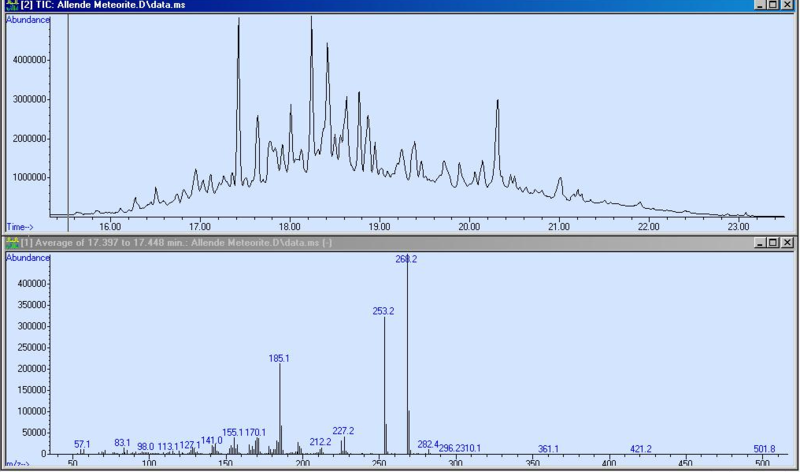 The RSIM mass chromatogram demonstrates the prevalence of many isomers of this compound which we did not identify but if as we believe it is a hydrocarbon is has 5 degrees of unsaturation. 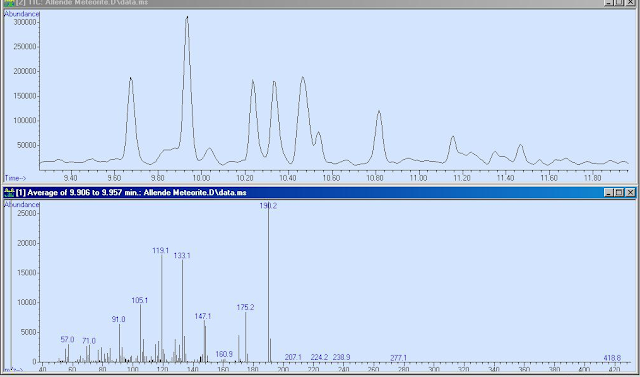 The Cold EI MS of one of these isomers that eluted at 18.41 min is shown at the bottom trace. Figure 9. 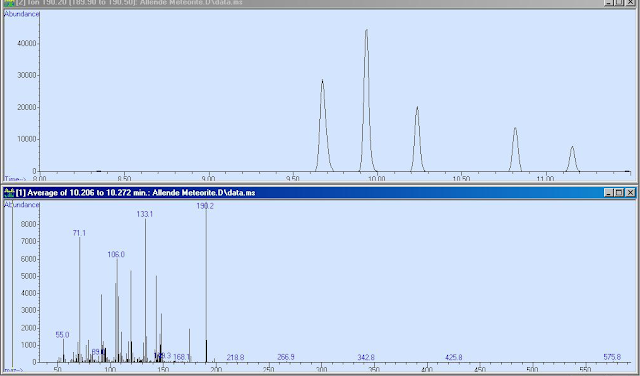 RSIM with m/z=231 mass chromatogram of a particle from the Allende Meteorite which was thermally extracted with the ChromatoProbe at 250ºC injector temperature around the hump of main group of eluted compounds. 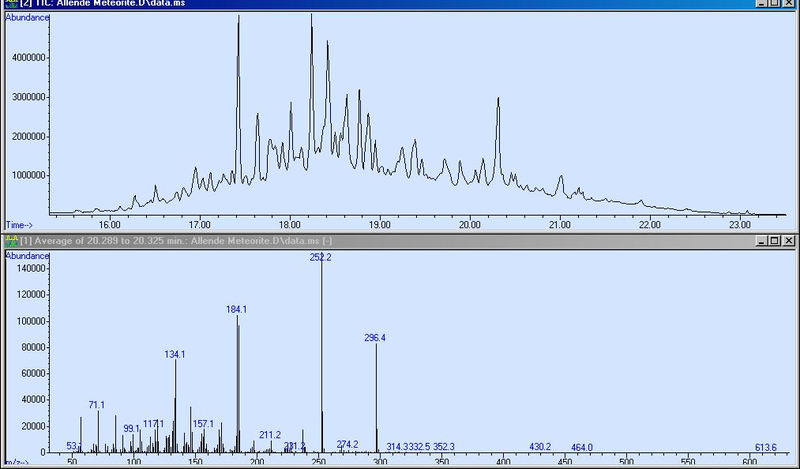 m/z=231 is a known marker of triaromatic stearanes and the Cold EI mass spectrum (bottom trace) is of one of these peaks (the highest peak) with the 5975-SMB. The Allende meteorite sample showed a unique yet diversified amount of hydrocarbons. Its organic matter was grouped in a narrow range of carbon size and each main compound was distributed among many isomers. We did not find any standard PAHs in the sample. However, the majority of hydrocarbons in the sample seem to be highly unsaturated hydrocarbons with several such as five degrees of unsaturation and/or rings. The most abundant compound in the sample is with molecular weight of 272.3 in its various isomers and one conjectured structure is given below based on NIST library attempted identification of the main m/z=272 peak at 18.24 min elution time as Kaur-16-ene, (8á,13á). Our opinion is that this sample is authentic. This mixture represents an estimated almost 1% of Allende organic material and it is a unique mixture which is focused around majority of C20 compounds and isomers (m/z=268-274). C20H32 alone exhibited well over 20 isomers. Furthermore, the fact that different meteorite pieces exhibited similar but not identical chromatograms hints towards extraterrestrial origin as terrestrial origin contamination should give homogenous one mixture source while extraterrestrial source could be non uniformly changed by heat during entrance to earth. If this is truly extra terrestrial matter it could hint to extraterrestrial plant origin since these compounds could originate from terpene chemistry as on earth. However, this conclusion must be supported by additional evidence. In this analysis the 5975-SMB GC-MS with Cold EI provided a wealth of identification information and based on its provision of enhanced and trustworthy molecular ions to all hydrocarbons, including highly branched isomers, we could uniquely demonstrate the importance of isomer distribution analysis. The Cold EI data file is available for further data analysis upon request. M. A. Sephton, C. T. Pillinger and I. Gilmour "Normal alkanes in meteorites: molecular δ13C values indicate an origin by terrestrial contamination" Precambrian Research 106, 47–58 (2001). Y. V. Kissin "Hydrocarbon components in carbonaceous meteorites" Geochimica et Cosmochimica Acta 67, 1723-1735 (2003). M. K. Spencer, M. R. Hammond, and Richard N. Zare, "Laser mass spectrometric detection of extraterrestrial aromatic molecules: Mini-review and examination of pulsed heating effects" PNAS 105, 18096-18101 (2008). A. Amirav, A. Gordin, M. Poliak, and Alexander B. Fialkov "Gas Chromatography Mass Spectrometry with Supersonic Molecular Beams" Feature Article in J. Mass. Spectrom. 43, 141-163 (2008).